With the success of tourism in India, river cruises are gaining huge popularity. With the best services offered on board and amazing views that surround such an expedition, river cruises are becoming a popular choice for touring. Besides luxury ground travel, India is progressively becoming a prime location for luxury cruises. These luxury cruises here are highly successful in exploring the real India and it’s breathtaking geography of several regions during one cruise. So, it’s time to spend your holidays with great comfort and luxury along with your family, friends or your partner. Let’s check out these Top 5 River Cruises in India that you need to explore! Cruising in the holy waters of River Ganges is truly an ideal way to see India with ease. Being one of the primary tourist destinations, river Ganges is the starting point for a host of luxury river cruises. These cruises give you a golden opportunity to explore the depths of the beauty and rich history along the river Ganges. With a blend of history and religion, you will come away with a greater understanding and appreciation for this colorful, dynamic country. You will pass 6 forts including the ancient town of Bhagalpur, and the Munger Fort that can be explored in comfort and style. The Ganga River cruise tour is doubtlessly a great place to relax, unwind and enjoy a fascinating vacation. 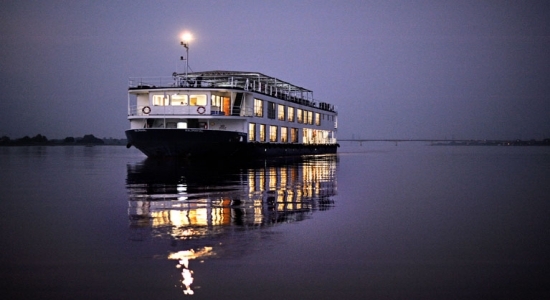 The most luxurious cruise along the Brahmaputra river is perhaps one of the best ways to explore Assam’s richness. The river is so alluring and it’s surroundings are even better. This luxury cruise travels along the beautiful, holy and historic Brahmaputra River which gives you an opportunity to discover the enchanting countryside, the exotic wildlife, and the surrounding villages. This river cruise takes the passengers on an exotic trip, leading them into the beautiful flora and fauna of the Kaziranga National Park in Majuli. Aside the flora and fauna, Brahmaputra River Cruise offers you an opportunity to witness the beauty of famous Indian Dolphins of the Ganges. For nature lovers! Just think of crossing the thick mangrove forests and winding rivers in India’s largest delta – Sunderban cruise is absolute riverine bliss! It offers a spectacular view that takes you along the pristine beaches, creeks, forests and islands of the Sunderbans, spread with rich flora and fauna for the nature lover. Furthermore, you can also enjoy the changing colors of the river from the deck of the cruise. Starting from Godkhali, the cruise, which is quite famous for its excellent onboard hospitality, leads you to the elegance of the tiger reserve with an assortment of diversity to witness. Being one of the most pristine and natural regions of India, Andaman island views are certainly most attractive and unique. The Andaman Islands River Cruise leads you on a wonderful and exciting journey that features incredible views of azure waters of the sea and picturesque sights of the surrounding tropical islands. Planning a trip to Mangalore? Consider Mangalore Cruises that could simply take your breath away! The luxury cruises here are quite a hit with tourists that not only offer you amazing views of the sea but also take you through dense jungles, sea views and wilderness at the same time. Rapidly emerging as an important tourist destination in India, Mangalore has also acquired great popularity as a place to enjoy cruising that gives the tourist a memorable experience. The cruise full of luxury and lots of facilities and opportunities for enjoyment. Prepared by skilled master chefs, the fares are delicious. Overall, a relaxing experience when visiting Mangalore. Who doesn’t love Goa? We all do! After all, it is one of the most amazing spots in India which is recognized for its variety of cruises. Being a perfect destination to visit during any time of the year, Goa cruises are otherwise known as Princess cruises and Cunard Line where you can completely enjoy the midst of the sea, beaches, waves, and the sunshine altogether. The Goa region has attracted some of the world’s most deluxe ocean cruise ships. Goa cruises let you embark on a fun journey where you can also enjoy various festivals of Goa such as Christmas celebrations, Goa carnival and so much more. An exotic beach destination with most wonderful and remarkable cruises, promises complete delight, fun, and adventure for the visitors. About The Author: Naina Roy is a travel & adventure lover blogger. Currently she is associated with 10deals providing best deals in chandigarh. Her hobbies include traveling, cooking, dance, and spirituality. She loves to explore & share her Adventurous travel experiences & stories.